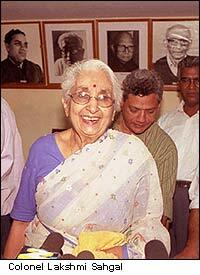 rediff.com Special: Kabir Khan believes Colonel Lakshmi Sahgal would make a terrific President. I came to know Colonel Lakshmi Sehgal when I was directing the documentary, The Forgotten Army, retracing the Indian National Army's attempt to free India from British rule. The film traced the INA march from Singapore to Imphal [now the capital of Manipur], where it was defeated and forced to retreat, looking at the events through the eyes of Colonel Sehgal and Colonel Gurbaksh Singh Dhillon [another famous INA veteran, he passed away a few years ago]. Since the film's producer, Akhil Bakshi, had made all the necessary preparations, I did not get a chance to meet Colonel Sehgal till we both were in Singapore just before the shooting began. This was December 1996; she was over 80 years old then. Yet, she and Colonel Dhillon were amazingly fit, both physically and mentally. They remembered details of events that had occurred over 50 years ago. In fact, they would cross a ground and recall what exactly had occurred there, the exact dates, and so forth. When we were planning the documentary, we were worried whether Colonels Sehgal and Dhillon would be able to take the strain of travel. They agreed, but we had to make a lot of arrangements, including promising to fly them out in case they fell ill. Remember, this was not easy because, once we entered Burma, there was no airport nearby. That country's infrastructure is very poor. But once we began shooting, all these concerns were thrown to the wind. They would be up and about at 5 am, they'd be walking all day long with us following and they'd be narrating all these stories about the INA and its march... It was an absolutely amazing experience! So Colonel Sehgal -- in 1943, she was not married and was known as Dr Lakshmi Swaminathan -- then a practising doctor in Singapore, began collecting women to form the regiment. She managed to put together some 25, 30 women; they had no uniforms so they hunted around for white saris and they practised with rifles for days with the help of some military officers in the INA. And then, they presented a guard of honour to Netaji, who was absolutely thrilled with the effort. That was the beginning of the Rani of Jhansi regiment. She went on to head it and later became a part of Netaji's cabinet. So we began the march from Singapore, through Malaysia and Thailand, and into Burma. The amazing thing was that Colonel Sehgal's memory was crystal clear; she'd remember houses and grounds and recall what had happened there. And, while narrating, they'd go from one story to another to a third and so on. In Maymo, which served as the provisional headquarters of the INA, she actually met the man who was Netaji's doctor [Dr Banerjee] and who, after the war, had stayed on there. She was very happy when we visited Mount Poppa, where she had never been before. It was due to the INA action at Mount Poppa that the British put on trial [in the famous Red Fort case] Colonels Shah Nawaz Khan, Gurbaksh Singh Dhillon and P K Sehgal [who Lakshmi would marry after the war]. My impression of her is that she is an amazingly engaging lady. Such an interesting person, such an individual person� It is easy to see why she has been chosen by the Left parties to be their Presidential candidate. When I met her, she was so full of pep and enthusiasm that I can imagine what she must have been like in the 1940s, at a time when there was a great cause to fight for. A lady who, at her age, runs a clinic every day where she treats poor patients! In fact, there was a report in the papers recently about how her patients were missing her because she had gone off to Delhi to file her nomination papers. So I can imagine how she must have been 50 years ago, when she was just in her 30s� running around, galvanising the other women and inspiring them. The Rani of Jhansi regiment was not a showpiece as some like to believe. True, they lacked military training but they were highly motivated. I met a lot of them during the filming and all of them would run to meet Colonel Sehgal. The way they'd meet her, the way they'd talk about her... she must have been one hell of a lady, a terrific role model! Remember, the bulk of the men in the INA were already military personnel who then joined Netaji. The women were all civilians who had given up everything to go and fight for their motherland; and it was a motherland most of them had never even seen since they were second or third-generation Indians who had grown up in Southeast Asia. The fact that she was able to mobilise them and take them up to the front to play a supporting role to the men who were fighting the British speaks volumes for her qualities. If you meet her -- and I haven't met Colonel Sehgal for a few years now, especially after I shifted from Delhi to Mumbai -- you will notice the sparkle in her eye, which completely overwhelms anyone who meets her. She can discuss anything you want, she is very aware of everything around her. That is probably why the Left picked her as a candidate. What is sad is that this is being done at a time when she is 87 years old. She is no doubt an amazing lady and she has been like this for all these years. So why is the Left picking her up now? Why could they not have picked her up earlier? There is no doubt that she would make a terrific President. Unfortunately, it is a foregone conclusion that she won't win. It is just so sad that she has been picked as a candidate so late in her life and at a time when she has no chance of winning.